Aims Tree Service: tree triming & tree removal throughout Houston area. "Our AIM for great service is on target"
Thank you for visiting our website. AIMS Tree Service, LLC offers tree services and commercial landscaping for the Houston metro area. We travel and provide tree trimming and tree removal services from Conroe to Galveston, from Baytown to Rosenberg. Our team of professionals are on hand to answer any questions and provide you with suggestions. Our goal is to provide GREAT customer service! We value our customers and believe that a customer is like family, so we treat them well. And if you are satisfied with your AIMS experience you will enjoy your trees and landscape for many years to come. We offer free onsite estimates and are available for 24 hour emergencies. 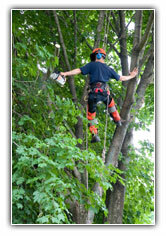 AIMS Tree Service is a locally-owned family business. With over 10 years experience, we offer reasonable prices on tree trimming, tree and stump removal and other related tree services – all with great service. We are fully insured and provide tree triming and tree removal services to the Houston Metro area including, Sugar Land, Fort Bend County, Katy, The Woodlands, Friendswood, Houston, Conroe, Bellaire, Spring, Galveston, Baytown and all points in between.